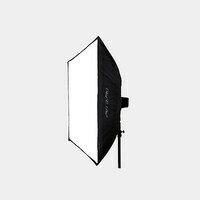 A grid is used on a softbox to control light spill and tighten the total coverage area; this can be particularly helpful in tight shooting environments. The soft, even light quality of the boxes remains, but the grids allow you to have more directional control over the output by tightening the beam spread to 40º. The black fabric grids have velcro edging, allowing them to attach to the front outer lip of the exterior black shell of the foldable softbox. The velcro inside the outer lip of this exterior shell is a wide strip that accommodates attachment of both the front diffusion panel and the grid.